Head over to Zilker Park, Austin&apos;s largest and most popular park, where kids can hop aboard the Zilker Zephyr miniature train or spend the day paddling a canoe on Lady Bird Lake. 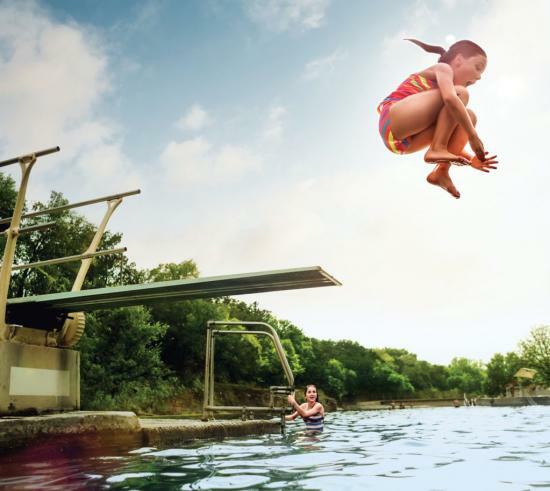 The park also boasts a multi-age playscape, numerous hike and bike trails and Barton Springs, a natural 68 degree spring-fed pool that can be enjoyed year-round. Take the kids out on the water with the exciting and educational Austin Duck Adventures, an amphibious tour of downtown Austin and Lake Austin aboard one of the unsinkable Hydra Terra vehicles. Tours leave from the Austin Visitor Center and run about 75 minutes, taking you to many of the must-see sites around town. Finish off the experience with a stop at one of Austin&apos;s many food-court trailer parks for some delicious, inexpensive food from some of the city&apos;s best food trucks. If you want to get out of the city for a little while, consider a day trip to a nearby state park, such as McKinney Falls, a 635-acre park with miles of trails, campgrounds, picnic areas and wonderful waterfalls. Pedernales Falls State Park is another great option. It boasts camping, picnicking, hiking, river swimming, mountain biking, fishing and horseback riding. Stay tuned for Parts Two and Three for other great spring break ideas in Austin!